The Federal Commission on School Safety, which was established in response to the Parkland shooting, will not analyze the connection between firearms and school shootings. “That is not part of the commission’s charge, per se,” DeVos finally confessed, after previously trying to skirt the question. 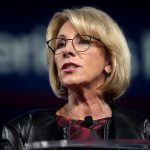 The U.S. Secretary of Education has five main responsibilities: advise the U.S. president, review the current curriculum and implement changes when necessary, protect students’ civil rights, lead research and evaluation efforts, and manage sub-departments. In March 2018, President Trump put U.S. Education Secretary Betsy DeVos in charge of the Federal Commission on School Safety. Other commission members include Attorney General Jeff Sessions, Secretary of Health and Human Services Alex Azar, and Secretary of Homeland Security Kirstjen Nielsen. “So you’re studying gun violence but not considering the role of guns?” Leahy queried. “We’re actually studying school safety and how we can ensure our students are safe at school,” DeVos replied. 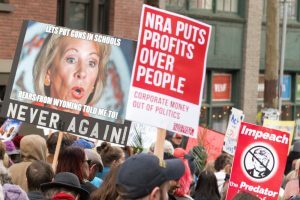 “Do you believe an 18-year-old high school student should be able to walk into a store and minutes later come out with an AR-15-style assault weapon and hundreds of rounds of ammunition?” Leahy asked DeVos.